It’s late afternoon when the crew and I enter the town of Duchesne. It’s time to find a place to park for the night. Starvation Lake State Park is a few miles northwest of town. I’d really like a free camp instead. Maybe a local can help me find one. I turn into the parking lot of Family Dollar. I’ll ask someone in the store about camping along the river. I reach to turn off the ignition key when I notice a National Forest ranger office! Leaving the crew in the PTV, I dash across the street. A woman greets me with a friendly hello. She gives me free maps of the national forests of northern Utah and brochures of state parks. Back with the crew in the PTV, I’m all smiles. “Well, guys, we’re on our way to our first Town Camp!” This is so exciting! The fairgrounds are easy to find. A grandstand overlooks a large ring. Behind the grandstand is an open-sided barn for animals. Looking further I spot the small park and drive up to it. This is the place. It’s wonderful! Right when I think it couldn’t be any better . . .
There’s the river! I tug at the crew’s leashes. “C’mon! Let’s go see!” We sprint across the little park and find a paved walkway alongside a deep, clear, fast-moving river . . . the Duchesne River! Right outside our door! The river walk leads us upstream and across two small bridges. We stop to watch the river race past us. I marvel at our good fortune. That was so easy! Drive into town, walk into the National Forest office, ask for a free camp along the river, and here we are! Later I sit at a picnic table in my private park to enjoy a drink while looking over the maps and brochures. Bridget lies in the grass. Spike soaks in a pool of water he’s found at the edge of the park. After a breakfast of hot oat bran with cinnamon at the picnic table, I decide it would not be good to stay camped next to the little park. It’s Saturday and surely people will congregate here. However, I don’t feel like another day of driving. I’ll do like Tioga George. We’ll make a day camp in Duchesne, come back to camp at the park again tonight, and then leave in the morning. First I do a little shopping at the Family Dollar and Al’s Grocery. Then the crew and I go out to Starvation Lake State Park. It’s only about three miles outside of Duchesne. The lake is surrounded by hot, dry, rocky areas. The campground is nice enough, although to me it seems crowded. It doesn’t look like the kind of place where dogs can easily go for a swim. Boating is the big thing here. Instead of hanging around the state park at a day-use cost of $7, we return to town. I remember seeing a small park at the edge of town. 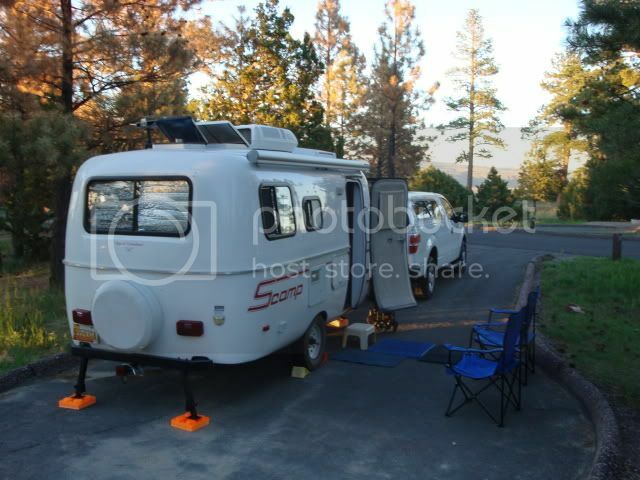 This entry was posted in Simple living and tagged casita, dry camping, Duchesne, Starvation Lake Stae Park, Tow vehicle, Utah. Bookmark the permalink. And another thing (!) – you’ve lost weight! You look great (not that you looked bad from earlier pics but geez, I’d say you look like the younger sister of the woman whose pictures precede these). Now, back to my regularly scheduled laundry……..it seems like it’s all I do w/ teen boys in the house! Thanks, Lacy. If you’re not doing laundry you’re buying or cooking food, right? Are you spying on me??????? lol My life takes place either in the kitchen, laundry room or my endless trips to the grocery store!!! Gee, no wonder I love hearing of your adventures and long for the day to do the same!!!!!!!! I agree with Lacy! Seems the diet is working extremely well! You look great! And what a wonderful campspot! You ride with an angel on your shoulder!!!! Glad you are taking a day off from the road! If every free camp were this easy to find . . . wouldn’t it be wonderful? I figure two free nights here balances out the $20 spent at Green River SP. Thanks for the compliment on my weight loss. You’ll be driving through Wyoming-like country, pretty remote and open, mtns in the distance, if at all, but easy driving. Lots of antelope. I still haven’t made a decision! Now I’m leaning toward throwing caution to the wind and continuing on up to Flaming Gorge. A few hours ago I decided to go around through Heber City! Going east to Craig in CO will put me off-track for the Grand Tetons although an easy drive is tempting . . . Here I am, as usual, not able to make a decision until the last minute. The drive up through Flaming Gorge is really pretty. I think you could do it, you’re getting to be an old hand at mtn driving and the PTV would make it fine. I can use the self-timer but it’s difficult to get my head in the lens view! I usually end up with a pic of my shirt or the air above my head. The slideshow photos of me and the crew were taken by a lady passing by. She was carrying a camera with a huge lens. I handed her my camera and asked her to take a few photos. She was happy to oblige. You look fantastic!!!!! All the pictures are great. You pick the most picturesque places to camp. The water looks so blue! Safe travels as you continue on. Thanks, Pauline. This is a very pretty area. Spike, Bridget and I walked from the park at the edge of town over to another part of the river where it is very wide and shallow. Spike took a soak, of course. The road goes over the river near where we were. I knew it would come to this, sooner or later . . . The three of us under the bridge! You are looking good, what is the name of that diet again, and how do I get it. Do an online search for the Dukan diet. It’s the easiest diet I’ve ever tried. Vernal has a neat Dinosaur Museum. We’ve driven up from Vernal to the Tetons (around 1986), our 16 yr. old pickup at the time needed radiator work (being a teacher, I was stretching our $ to be able to travel) route 191 was narrow & really twisty then, I used the window washer to spray water onto the radiator to keep it cool going up. In 2010, we drove down from Flaming Gorge to Vernal, route 191 is now a wide two lane & not as twisting, shouldn’t be too much of a white knuckle drive. With our 2009 F-150, we had no trouble pulling the hills up to Flaming Gorge, nor down to Vernal. We made it on to Banff then to Vancouver then down the west coast to SoCal & back to Las Cruces with the old pickup & poor radiator. 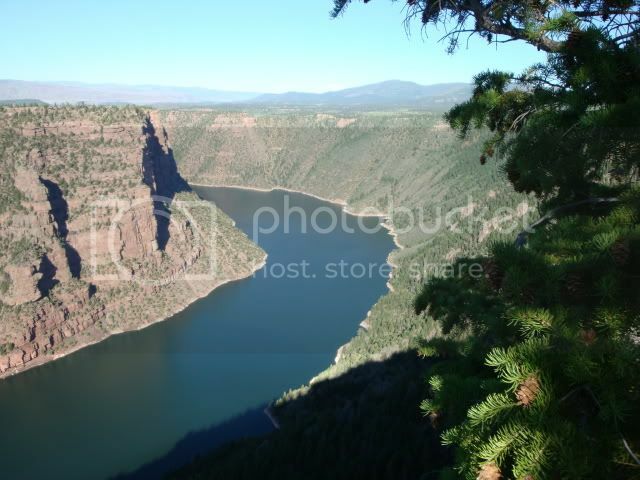 Flaming Gorge area has some neat sights & sites. The Visitor Center up on the rim is really neat. May get to see a few Big Horn Sheep there. There is a campground near by, we used the one at Firefighters Memorial & the one near the Dam & boat ramp. Not sure of Boondocking ones. Been enjoying your blog, keep up the good work. I google mapped the route, not really a four lane highway, but it does have passing lanes in the steepest & curvy areas. I had hoped my memory was correct, not as good as I hoped. DesertHawk . . . I watched a time-lapse video of the drive up that road on YouTube. It doesn’t look too terrible. I don’t know why I’ve been so apprehensive. Not to sound weirder than usual . . . In the last few years I’ve learned to pay attention when I have vague feelings of uneasiness or recurring dread about something. Sometimes thoughts of someone will keep popping up and then I find out they went through a crisis or had a day from hell. Or maybe it’s the name “Gorge.” I don’t like looking down into big holes in the earth. Thanks again for taking the time to help me decide what to do. At this moment I’m ready to skip Flaming Gorge and shuffle off to Colorado as Chinle suggested. Sue, I’ve driven lots of mtn roads in every possible bad condition, and after all that, I’m with you. I hate scary roads, esp. pulling a trailer. Will be interesting to see which direction you headed. Wow, what a nice free camping place !! I wonder how long one can camp there ? I didn’t ask how long I could stay. Sometimes it’s better to go ahead and apologize later if necessary! From what I’ve read on blogs, usually 1-3 days are allowed at fairgrounds or in-town camps. Since I wanted to stay 2 nights, I made us scarce during the day, didn’t camp up close to the park, cleaned up after the crew, and didn’t put anything outside. Don’t miss the Tetons. One of my favorite National Parks next to Yellowstone. I’ve wanted to see the Tetons for a long time. A lot of people have told me they’re their favorites. a couple of those pics are so perfect they almost look fake. That water is beautiful! The crew and I walked the river walk before going inside for the night. It’s about a mile long with several viewing platforms along the way. . . . red-winged blackbirds in the reeds, singing their nightly song . . . the river rushing by . . . It’s been a treat to camp here. Roxanne, glad to hear you are joining us. It is an easy diet and there are a lot of websites with US recipes on them. I am on a slow loss program – around 3/4 #s a week. Sue does look good and she’s an inspiration for many others – in more ways than one or two. Especially tackling those curvy roads – just think in a short time, she’ll be taking them like an expert. Hi Emily. Down 12.5# now and, yes, the rate of loss is slowing down a bit, but I am very happy on the Dukan plan. I belong to the Dukaners forum, and get a lot of good info, recipes, and support there. Roxanne!!! That’s wonderful!!! Congratulations!!! Isn’t it amazing? I like that you never have to go hungry. I wish you continued success. I’m very happy for you. Thanks, Cathie. I get that daily list. It’s nice that you put the link here for anyone reading this.